As 39-year-old Binnur Apaydin was being rushed via helicopter to Santa Rosa Memorial Hospital last year, she clutched her chest and said to herself, "I'm dying, no more time for me." The Turkish immigrant had gone to see her doctor in Petaluma, complaining of chest and neck pain. He diagnosed her as having a heart attack and told Binnur that a helicopter was her best hope. She resisted leaving and said she just wanted to see her husband and daughter, but the doctor put her in the copter. In Santa Rosa, they raced Binnur into the operating room, inserted two stents and saved her life. But months into her recovery, Binnur went into a funk. She didn't have much to do, her husband Ozkan Apaydin had lost his job, and, unable to pay their bills, the couple lost both the house they owned in Sacramento and their farm in Turkey. "The budget was too tight," she says, "everything was upside down." Binnur's doctor said she needed to get more involved with life, and her brother, Serdar Besir, said he'd come to Petaluma to help the Apaydins open a restaurant. "After the heart attack, I kept having a dream that tomorrow is my last day," Binnur says. "My husband said, 'We have to do something to bring you back to the real world.' My brother, then working as a chef in New York, said, 'Let's open a restaurant.' I said, 'It's crazy, too stressful, but as long as the family is together, OK.'"It wasn't the Apaydins' first foray into the restaurant business. They'd briefly run Real Gyro in Santa Rosa's Stony Point Plaza. But after just six weeks, it closed due to a dispute with the landlord. Santa Rosa's loss is Petaluma's gain. Real Döner opened last March at the corner of Petaluma Boulevard and D Street, serving authentic Turkish food including döner (a lamb, beef or chicken wrap with tomatoes and cucumbers, the Turkish version of a gyro; $8), meaty kebabs ($9), a red-lentil soup ($3.50) and lahmacun ($3.95), a thin pizza layered with ground beef, tomatoes, onions and paprika. The decor is basic; diners order at the counter, then the food is brought to the table, either inside the restaurant or on the outdoor patio. The long room is enlivened by a big, brass, 250-year-old shoeshine stand that's been in the family for generations, a towering hookah and a pair of "evil eyes," a blue Turkish emblem said to ward off malevolent spirits. Two vertical spits slowly turn, one roasting beef and lamb, the other searing chicken. In a rack by the register, Turkish magazines and bags of ground coffee share space with Cheetos, Doritos and Fritos. There's a bowl of customers' business cards on the counter. Every day, Ozzie, as his friends call him, picks one and gives away a free meal ($10 limit). So, yes, in Petaluma there is such thing as a free lunch. The refrigerated front counter has such raw skewers ready for grilling as the popular Adana lamb kebab. Atop the counter are heaping platters of desserts: baklava, which Ozzie swears originated in Turkey ($3.95); and the irresistible buibul yuvasi ($2.50), a bird's nest of phyllo dough thinner than angel hair topped with pistachios bits and light syrup. "I can say we're the best in the Bay Area—we know how to do it; it's a Turkish dessert," Ozzie says. It sounds boastful, but after one bite of the sumptuous pastry, I heartily concur. "Some people say, 'Sweet is no good for me,' but we broke them down," Ozzie says. Ozzie's brother-in-law, Serdar Besir, emerges from the kitchen, takes one look at my buibul yuvasi and whisks it away, insisting it has to be hot. He returns after warming it and sets it down with a cup of Turkish coffee ($3.50). Served in little china cups, the coffee evokes memories of Istanbul's cafes, the deep brown brew rich and flavorful with just the right interplay of sweetness and bitterness, with an espresso-like caffeine kick. "I want to make people happy," Besir says before gesturing toward his brother. "But his goal? It's to make money. ""Of course," Ozzie laughs. "I'm the manager." Ozzie has worked hard for his success. 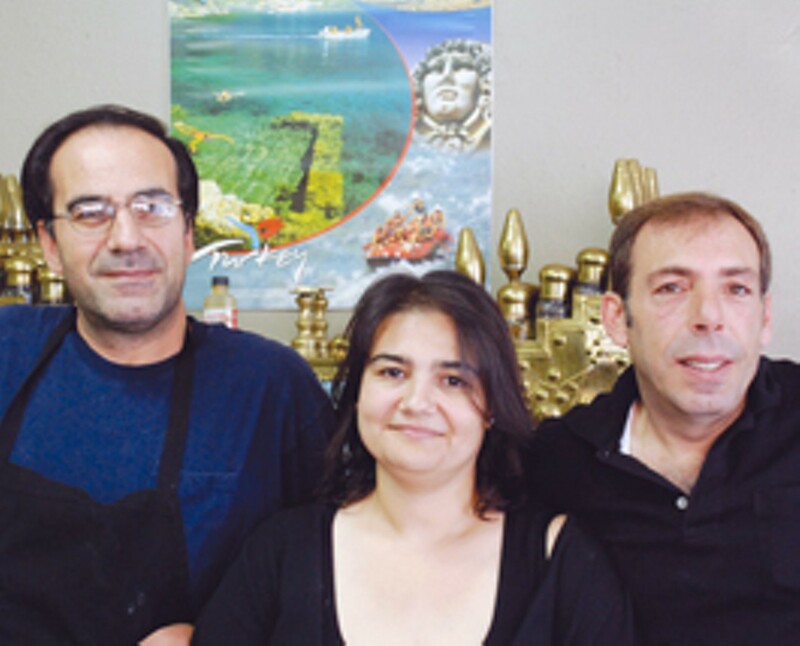 He left a thriving appliance business in Mersin, Turkey, and brought his wife and only child to the United States. in 2000 because Binnur wanted their daughter to get an American education. Cagsar, then eight, is now going into her senior year at Petaluma High. "She has a good report card," Ozzie says. "I'm very happy." Binnur adds that her daughter now wants to be a doctor, so she can "cure my heart." After coming to the States, Ozzie worked in a parking garage, for a shuttle company and then drove a taxi for four years. Showing typical immigrant ingenuity, he'd find out when cruise ships were landing, when hotel guests were checking out and when conventions were in town to ensure he'd always have fares.That hunger has paid off at the restaurant. Real Döner has been a hit since its opening day. "For the grand opening, we ran a special: buy one döner, get one free. We had a line that stretched an hour and a half. I was shocked." Most Americans know what a gyro is, but many have never heard of döner. The Apaydins chose the name because it's Turkish. "American people are so good," Binnur says. "They may not know what döner means, but they give us a chance." Despite the recession, the Apaydins are doing well. They're not getting rich, but they're getting by, and, most important, Binnur's health is improving. "Working in this restaurant is part of the healing," she says. "My whole family is together—that makes me more strong." A customer comes to pick up a to-go order and she's about a dollar short. She said she'd run to her ATM, but the Apaydins say, "Don't worry, you can pay next time." That's the kind of place Real Döner is—the owners act as hosts and make the customers feel like family. "We don't have fancy tables or lights," Binnur says, "but we do have warm friendship and good food." The restaurant is open from 10am to 10pm daily, and the cooking starts around 6am. "The bread has to be fresh, the meat has to be right," Binnur says. "We don't open a box and put it on a skewer; we have to find the right spices, so we go to San Francisco. We have to find the right organic tomatoes, not just any organic tomatoes, but good ones. I have to smell it. It's the little details, that's what makes the whole. So, yes, it's a hard job," she says. "But I'm a hard person, and hard things make me more powerful." The intense work started before the restaurant opened in a building that needed an overhaul. "We fixed the walls, we fixed the ceiling, we put down a new floor. We made a picnic in here and kept working to 1am," Binnur says. "We fixed this place. And this place has fixed my heart." Real Döner, 307 F St. (at Petaluma Boulevard North), Petaluma. 707.765.9555.